In order to connect and engage with increasingly mobile shoppers, many leading retailers are implementing a Short Message Service (SMS) strategy. With an opt-in text message campaign, retailers are finding a new channel to provide shoppers with news, sale alerts and recommended items based on past purchases. 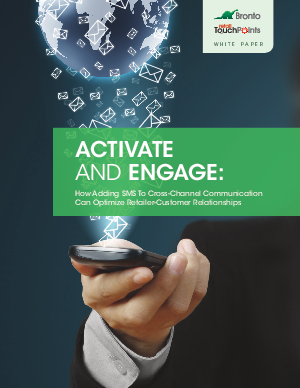 Download the white paper, "Activate And Engage: How Adding SMS To Cross-Channel Communication Can Optimize Retailer-Customer Relationships" to learn more about how text message campaigns can successfully activate consumers relationships and engage shoppers to drive purchases.